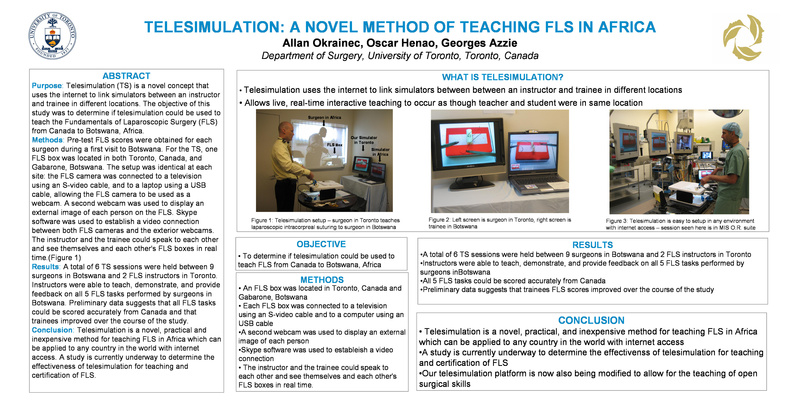 Objective: Telesimulation (TS) is a novel concept that uses the internet to link simulators between an instructor and trainee in different locations.The objective of this study was to determine if TS could be used to teach FLS from Canada to Botswana, Africa. Methods: Pre-test FLS scores were obtained for each surgeon during a first visit to Botswana. For the TS, one FLS box was located in both Toronto, Canada, and Gabarone, Botswana. The setup was identical at each site: the FLS camera was connected to a television using an S-video cable, and to a laptop using a USB cable, allowing the FLS camera to be used as a webcam. A second webcam was used to display an external image of each person on the FLS. Skype software was used to establish a video connection between both FLS cameras and the exterior webcams. The instructor and the trainee could speak to each other and see themselves and each other’s FLS boxes in real time. (Figure) Results: A total of 6 TS sessions were held between 9 surgeons in Botswana and 2 FLS instructors in Toronto. Instructors were able to teach, demonstrate, and provide feedback on all 5 FLS tasks performed by surgeons in Botswana. Preliminary data suggests that all FLS tasks could be scored accurately from Canada and that trainees improved over the course of the study. Conclusions: Telesimulation is a novel, practical and inexpensive method for teaching FLS in Africa which can be applied to any country in the world with internet access. Final data with post-test FLS scores will be obtained on a future trip to Africa to determine if telesimulation is an effective method for teaching and certification of FLS.